My ancestors lived on Swona and I have longed to go there. Thanks for a glimpse. Do you have any other photos? Marilyn there is a lovly recording on Swona done by John Findlay called, Swona Memorial to a Lost Way of Life, . I can recommend it as it is very well done over a number of years. Very sad to see an island that was home to so many very capable people now only a rumble of falling down houses and neglected land. John, are we long, lost cousins? Did your family come from South Ronaldsay too? No Steven we are not from the Orkney Budges. Faither came over fae Caithness afore the war when Lyness was being made ready for hostilities!!. No disrespect to any Orkney Budges though!!. Is it possible to obtain a copy of 'Swona Memorial to a Lost Way of Life'? If so, from where/who/how? We are related to Rosie's too. Sandy Annal's wife was a Rosie. I believe that's how the Annals ended up owning the island. We're probably related, Martin! There's a lovely new book at The Orcadian Bookshop about Swona. Super pictures!! Hazel, You can get the DVD 'Swona Memorial to a Lost Way of Life' from 'Grooves', 17 Albert St., Kirkwall, KW15 1HP, Phone 01856 872239, they will post it to you. Hi Stephen, yes you most probably are related to my wife's side of the family, these Rosies pop up all over the place. If you can email me and tell me more about how the Annals are connected to us I would be delighted. You don't suppose they would give Swona back, do you??? It seems unlikely, but they were quite happy to let us tour the island when I was there in 1981. It was a wondrous site. So much history packed into a tiny island! I'll have to look up the family tree to give you more details, but Sandy (Alexander T.) Annal's wife was definitely a Rosie. I would gather the two sons (Cyril & Martin) own it now. Sandy died at the age of 99 in 2007. Thanks Martin: I have ordered one. I have heard Cyril Annal talking about Swona and was fascinated. That would be great Stephen. Cyril & Martin (I take it that's them on the DVD) look like Rosies, it's a strong gene my second youngest, Blair, is another one. They all seem to be long-lived, the Annals too. Martin, I gather you're in the UK, but not in Orkney? What is the name of the book on Orkney, I did not see it. Yes Stephen, we live in Nairn. Marilyn: I have one from the Islands Series published by David & Charles: Newton Abbot called (simply) "Orkney" by Patrick Bailey. 1974 Reprint. ISBN 0 7153 5000 5. Swona- by John S Findlay. Can anyone assist with details on the Rosie ancestry back to the 1700's? My wife descends from a Betsy (Elizabeth) who married a John Sinclair on Stroma 17/2/1721. I wish to trace her ancestry. I would get in touch with Cyril or Martin Annal. Their father had all the records & many family trees already written out. I am sure one of them could help. How about a Swona descendents reunion sometime at Swona of course?? 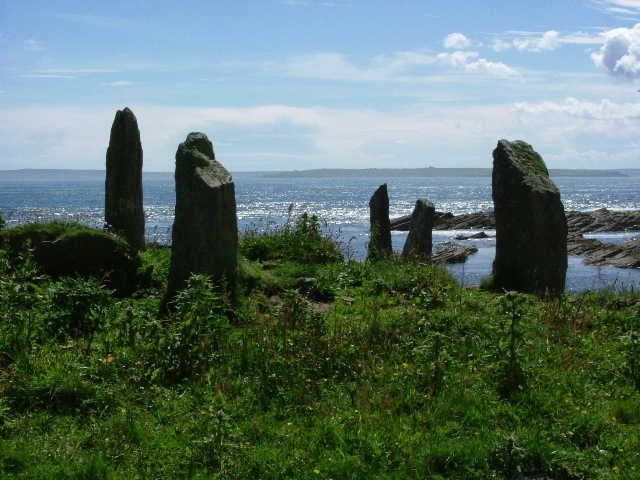 That's 2 places we should have gone to when we visited Orkney - Stroma and Swona! Lovely bit of camera work! Anyone else interested in a Swona desc reunion at Swona? Of course, we would need permission from Martin and Cyril Annal. When I tried to go there before, I could not find anyone to take us. If Mr. Ashford is still sending out copies of the Rosie tree I would be grateful for a copy. My 4 x Gt Grandparents are also Elizabeth (Betsy) Rosie and James Sinclair. Also Janet Rosie and John Wards. Where did your family move to, Peter? Mine came to Canada, first settling in Caledonia, Ontario, to work on the railroad. They had a ship built at Port Colbourne on Lake Erie, just a few miles from Caledonia, which they christened the "Eliza Allan" (after my great-grandmother) and sailed her to Manitoulin Island (in Lake Huron) where they settled for a while. The Budge family eventially ended up on the North Shore, mostly working in lumbering near Walford & Massey, Ontario. Hi folks, if you search 'John Rosie', (my wife's GGGG Grandfather),on this site you will see a Bagpipe Hornpipe called 'John Rosie of Swona' and story, even Swona men got it wrong now and then,:-) I also have the music file if you would like to hear it. Still think we should have a Swona reunion? My Allan line also went Great lakes. Would like to have a Swona reunion on Swona, if the Annal brothers agree. It is hard to find transport to swona also. It would be a feat to get people there and subject to weather. We could stay in Kirkwall or St Margarets Hope. Only 2 small hotels in St Margarets and you are still 15 miles to Burwick pier. Just as well stay in Kirkwall at least you will have a choice of accommodation and a nice trip over the barriers and pass St Catherine's Church. The cemetery is where most of the Rosies and Annals were buried. Its close to Burwick which is the closest harbour to Swona i think. I guess we need to know who is interested and then speak with Martin and Cyril to see if they would allow us a visit and assist us in arranging transport to Swona. Lets hear who is interested in pursuing this? When Cyril Annal took us over, we left from the harbour at Herston. I remember examining the remains of the steam drifter there while we waited. It was used extensively in one of Annie Lennox's videos. The late Sandy Annal, father of the owners of Swona, would have been rather surprised to read the comments of Peter Rosie on 11th inst. Sandy was away ahead of his time when it came to promoting tourism in So.Ron.and Burray. In the 60's he set up a rough and ready Hikers' Hostel on the Front Rd, S.M.Hope, which he later transferred to the house in Herston. There the visitors comments in the book were well worth a read and gave an idea of how much they appreciated the many provisions of free transport, food and the endless supply of stories and tales. I believe he may have bourne the cost of printing the then Tourist Brochure which then, as now had many places where visitors could find comfortable accomodation locally. I believe my parents - Art & Kay Budge - stayed at the hostel in Herston when they were in Orkney in the early 70's. I have a picture of them standing in front of it! I had the privilege of meeting Sandy on two of my visits. He told us some stories about our Orkney families and many about Swona and SR, some of which I have recorded. I always love staying in St Margaret's Hope. No offence taken Peter. For me, it is not just a tour but feeling the island, just soaking it all in. I have gone to other SR sites and just sat there, knowing my ancestors did the same before me; it allows me to imagine their lives. I know this may be odd to some. The idea of having Swona descendants gathering there, sharing a meal, sharing stories as our ancestors once did feels right! No offence taken,Peter. I think it is great to see so much interest taken in Swona and the prospect of many descendants of Swona people planning a reunion. Mr Norland Robertson a native of Longhope now living in Newcastle Ireland is decended from the "Alans o Swona", his mother was Anna Alan I think her folks moved to Waas"a long time back. Herbert you might ken something aboot them,Anna was married to Gordon Robertson fae here they had only Norland who was in the R A F and later an Engineering Inspector wae the R N L I now long retired and living in Ireland. My gr-gr-grandmother was Mary Sutherland Allan. Anna Allan's folk owned old North Row and Big North Row (which was built in 1929 if I remember right)that I grew up in. Mum always said you would have known he was a lighthouse keeper by the stair he built, it was a bit dangerous as my granny Grieve found out when she landed in a clatter coming down with the chanty in her hand. (bathromm was down stairs}:-( On the title deeds the Allan's owned Fae land at one time and sold pieces of land to Bob Johnston and other folks in the village as well. We had a right of way at Fae so Mervyn as a teenager thought he had every right to throw open the gate and snore along it on his motor bike but his grand-uncle Billo wasn't too happy when it was left open for his return journey! Dad used to park the snow plough down in the village on a bit of land belonging to North Row on the title deeds. Davie Heddle used to say he was the gardener at North Row and the old alders he planted are still growing there to this day. Just like to say a big hello to all my sSwona cousins, G g g grandson of William Allan/Catherine Rosie. I am the gr-gr-grandson of Eliza Peebles Allan and John Cogle Budge. Hi Anthony, is that the Catherine Rosie b1887, daughter of William Rosie? Does anyone know how to get hold of Martin or Cyril Annal? Just watched the Annie Lennox filmclip & it reminded me of my time in Orkney. I was a 23 year girl, backpacking alone around Orkney from Australia in the late 1980's and will never forget the day when Sandy picked me up in his panel van. I do not know how I came across hime but am very glad I did. I sat in the back with my backpack and a sheep while he drove to that fantastic stone building. I hope I never lose those memories of staying at the damp, dark, coal fired hostel on the shores of that misty lake, listening to Sandy's stories around the fire, visiting Sandy's beer brewing blacksmith friend (Billy?) and his Viking relic cave in the cliff face. I recall briefly meeting one of Sandy's sons (who drove past on a tractor) but I can honestly say stumbling across that majestic place and meeting that wonderful man will always be a highlight in my life. Is the hostel still standing ? Whatever happened to that cave ? Thankyou Sandy for the treasured memories. What a wonderful man. I hope I have time in my life to return one day. Hello Rosies! interested to learn about you all. My great-grandfather, William Sinclair Basketter lived on Swona aged nine with his sister Jane and their mother Jane Rosie on the 1871 census. She'd married their father in Wick in 1857, but seems widowed, or possibly married a second time to a Rosie? He trained in Greenwich with the Navy, meeting wife Elizabeth Ross from Poplar. They had five children, moving to Portland and Portsmouth, where he died in 1937. Hi Sue, I've got Jane Rosie 1835-1871 daughter of John Rosie 1806-1892 and Jane Sinclair 1806-1888. John Rosie was the son of George Rosie c1772-1862 and Barbara (Betty) Halcro 1776-1855. Betty was the sister Magnus Halcro, a direct descendant of Sir Hugh Halcro (of that Ilk) who was knighted by Robert the Bruce after the Battle of Bannockburn (1314)where he had commanded a force of 300 men from Orkney and fought like a hero. Every farm steading in Orkney used to used to light bon-fires on St John's Day to commemorate this event when the islands were said to be covered in a pall of smoke. Many thanks for the info Martin. What a week to discover an ancestor fought at Bannockburn! If at all possible I'd love a copy of the tree showing Jane who died in 1871(so young) - my GG Grandmother. I wonder what happened to her daughter Jane Basketter. I expect her grandparents cared for her. I'm susie228@btinternet.com, and live in Chichester. Thanks again. Hi every one. Xmas greetings to you all. My Grandfather William Robertson Allan came from Swona. His Parents were George Allan and Anne Flett. Hello again Rosie and Swona followers. Just to update you - I finally discovered what happened to Jane Sinclair Basketter, sister of my Great Grandfather William Sinclair Basketter, children of Jane Rosie (later Basketter), b.1835. She died in 1935 and lies in a cemetery (fittingly, by the sea) in Port Elizabeth, S.A. - beloved wife of John Johnson-Robson. She had a daughter Isobel and a son John, who died aged 27 in 1917, buried in Pas de Calais military cemetery. And Jane's father - William Dorham Basketter had died in 1864 when a tug bound for Russia sank not far from shore just north of The Firth of Forth, when she was a toddler and brother William a baby. Any info of her life (or descendants') between 1871 and 1935 would be greatly appreciated. Many thanks, Susan Basketter. Interesting that she lived into her 100th year. My great-grandmother lived to be 99. Must be longevity in genes from Swona. Interesting stuff about Halcro's as well. There must have been Halcro's in my family tree as well. My grandfather's name was William Halcro Allan Budge. Hi Stephen, thanks for your info. I realised my last post could be misleading, what with the many Jane Rosies! The Jane who died in South Africa in 1935 (sister of my Great Grandfather William) was born in 1859 in Stromness, so still a good innings. It was her mother who was born 100 years earlier in 1835, but sadly she died in 1871, sometime after the census was prepared. Best Wishes, Sue Basketter. Hi My name is Chris Hawthorne I am Canadian and wandered Europe for over a year with my backpack, tent and hitch hiking thumb. I stayed at the Herston Hikers Hostel in 1989 and then again in 1990. I travelled there by hitch hiking with some friends Phyllis, Tara and Nick. We stayed for many months and no one else came. Tara decided to stay and found work in bar I think she stayed for a long time. I got to know Sandy and Martin well. I worked at their cattle farm, and they shared supper with me often. I used to spend some time with a man by the name of Rick who lived at the other of the village. We had some great adventures. Martin even took us to Swona. Of the many memories that I have I will never forget taking it upon myself to go first footing on Hogmanay. Having drank a bottle of whiskey I stumbled down the village knocking on doors all the way until I found someone home. The family and friends invited me in, fed me and helped me on my way when the room began to spin. I fell in the rain at the stone wall at the end of their pathway.Martin came to pick us up to go into town but I was passed out well before Midnight.I was 20 and reckless but Orkney and especially Herston has remained one of the most memorable times of my life. Martin if you are out there shoot me a line. do you remember that young student your father picked up july 1972 from the street in order to help loading hey? I fixed the distributor of your car with a piece of wire. My father worked at Bosch. I'm glad having found this thread. Hope you are well even though having left the marvelous Orkneys. Often I think for that time and your lovely mother.